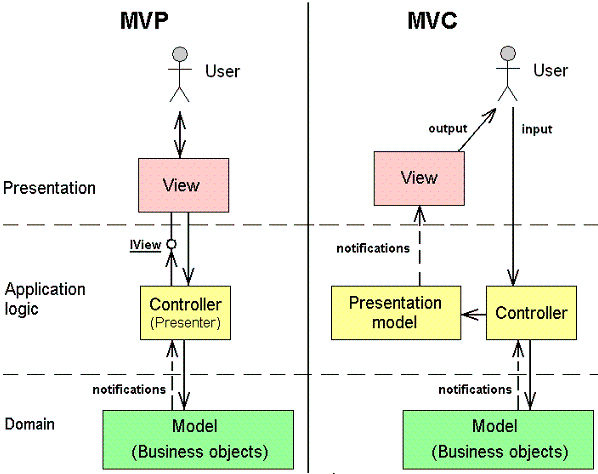 In MVC controllers receive and process user input, but in MVP views receive user input and then merely delegate processing to the corresponding controllers. That is why MVP pattern better fits modern UI environments (Windows/Web forms) where view classes themselves handle user gestures. In MVC controllers affect their views by changing the intermediate presentation model, which the views are subscribed to (by observer pattern). This makes views pure observers without direct access to them. MVP on the other hand violates this “pure observer” rule by providing a direct link from a controller to its view. This makes MVP more handy as compared to MVC.